Let’s talk a little bit about cliffhangers, shall we? When a show uses a cliffhanger at the end of a season, it does so with the intention of getting you to come back for the next one. (Or daring a network to renew your low-rated show, which never works so producers should stop doing it.) The ideal cliffhanger leaves you on a note of suspense or mystery, or with a plot development so arresting you spend the intervening months discussing what its aftereffects will be. 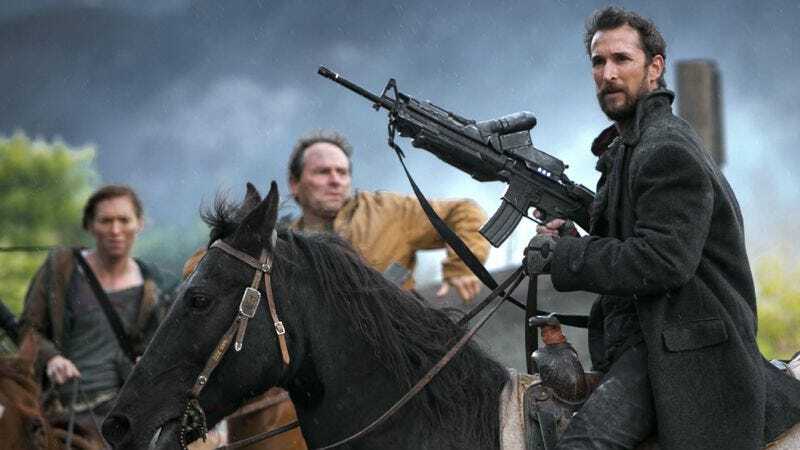 And there are many shows that do this expertly—whatever problems The Walking Dead has, for instance, it knows exactly how to set a midseason cliffhanger up to bait you for the second half of the season, and then throws you right back into the action when the show returns. And Grimm deploys its cliffhangers with a tongue-in-cheek attitude, adding an apology under the “To Be Continued…” message that says they know exactly what they’re doing and that what’s introduced will be resolved. 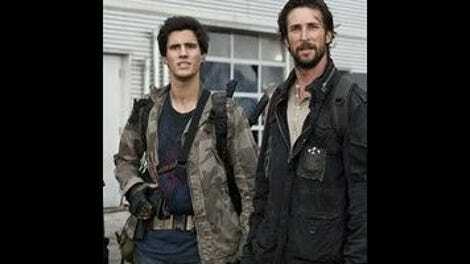 And Falling Skies, in its second season finale, certainly left a lot that needed to be resolved. The human resistance of Charleston, headed by Noah Wyle’s Tom Mason and Will Patton’s Dan Weaver, had won a major victory over the invading aliens, killing their overlord and destroying the tower they had erected, and were heading off to take the fight back to the aliens. Instead, a series of tremors forced them outside the base, and they were greeted with the sight of an entirely new alien race landing in front of them and offering an expression that seemed in the neighborhood of benevolent. It was a serious game-changer, and I for one was decidedly curious as to whether the producers had a plan in mind when they deployed it, or if this was just the last of a series of improvised deus ex machinas that frustrated me for the entire run time of the finale. So what do they do? They skip the resolution entirely. Well, that’s not exactly fair, as the alien doesn’t just take off and die on the way back to his home planet. What the show does do though is ignore the immediate aftereffects of the landing, fast forwarding seven months to show us how the balance of power has changed since then. The new alien race is introduced as the Volm, prior victims of the invading skitters and overlords—now identified as the Espheni—who travel the galaxy lending aid to other worlds who have been attacked. They have given their support and technology to the Charleston community, allowing them to win decisive victories over the Espheni forces and fortify their own position. And the members of the Second Mass have flourished in this new setting: Tom has been elected president of the Charleston community, Weaver has been promoted to colonel, Moon Bloodgood’s Anne is due to give birth within days, and Colin Cunningham’s Pope has become an Al Swearengen equivalent running his own shantytown outside of Charleston (called, awesomely enough, Popetown). It’s a discordant choice, and one that throws off the experience of watching the premiere. It’s not unheard of territory for the show as Falling Skies did a similar jump between its first and second seasons, but it successfully bridged the gap in the second season premiere with flashbacks to Tom’s time on the vessel and his journey back to the Second Mass, and a few scattered pieces of exposition. Here, there’s no bridging and no sense of why the writers made this call other than they thought it would be more fun to cover this area than the matter of establishing human/Volm contact. It also doesn’t help that the show seems entirely aware of the move it played, as every character feels the need to mention how much things have changed since the Volm landed. And more jarringly, everyone keeps saying it’s been seven months over and over again, so every time you start to settle in it takes you out the episode by reminding you of the leap they made. It’s disappointing that I have to spend this much time talking about how problematic the resolution of the cliffhanger is, because once you find a way to get past it, this is a solid return for Falling Skies. If you followed my reviews from last season you know I find this to be an often frustrating show, but also a show that’s possessed of a lot of positive elements. And much of the two-hour premiere— as with last season not a two-parter but two subsequent episodes— uses those positive elements to make me glad the show’s back, a grin crossing my face at the first sight of a mech and a first witticism from Pope. The introduction of the Volm is set up as a dramatic expansion of the show’s universe, and the show definitely has the feeling of a larger scale from the start. “On Thin Ice” for instance opens with a battle in an abandoned quarry, the most epic action scene the show has done to date. Every member of the cast is in play, starting off with Matt planting explosives of alien origin to disorient the mechs, leaving them open for Pope’s Berserkers and Hal behind a heavy machine gun to cut them to ribbons while Ben and fellow ex-harnessee Danni fight off the skitters. The victorious mood is suddenly shattered by two “mega-mechs” twice the size of the originals rearing up from hiding, sending the entire resistance scattering for cover. And then Tom and reinforcements ride up on horseback to shoot the mechs to pieces, rebel skitters join Ben’s assault, and a triumphant speech holds it all together. It’s a fun reintroduction to the show’s world, proving its skill at delivering sci-fi action when called for. And when the action moves back to Charleston, it manages to maintain some degree of momentum. I talked last season about how the decision to keep the Second Mass moving helped keep the action from getting bogged down the way it had in the first season with their elementary school base, and that their apparent decision to keep taking the fight to them at the end of the season was the right one. Now though, the resistance is entirely incorporated into Charleston life, and by making the show less about fortifying a position and more about building a community, it’s managed to locate a better energy than their first attempts. As president of this new nation— which he acknowledges is only 20 square blocks— Tom’s now officially in a leadership role, having to manage all the disparate elements that have come together under his protection. And there certainly are plenty of elements: the original Charleston residents who aren’t fond of these interlopers, Pope’s Berserkers grumbling about the state of affairs (“This is the new world order isn’t it? The Mason Restoration. Friend to all.”), the rebel skitters and their deharnessed allies, and the Volm encampment just outside of the city limits. The introduction of the Volm’s plan is a long game for the show, though it’s not the central focus as both episodes deal with keeping Charleston functional and its residents safe. The near-failure of the rescue mission at the start of “On Thin Ice” proves there’s a mole within Charleston command, which Tom tasks Arthur Manchester to investigate—a move he does too well, as Arthur’s executed by a mysterious shadowy figure before he can narrow down his list of suspects any further. While it seems like there’s an obvious candidate for the mole (who we’ll get to later), Falling Skies is maintaining enough mystery with his appearance that it’s likely building to some sort of twist. “On Thin Ice” is laying groundwork while “Collateral Damage,” on the other hand, is a more typically action-packed episode of the show, centered around a mission to disable a nuclear power plant keeping the Espheni mechs operable. This episode manages to let Falling Skies give into its better instincts, as it meshes the action scenes— Weaver’s troops pinned down in the woods, Tom’s team using that distraction to fight their way into the plant— with a genuine sense of creepiness as the plant is defended by skitter/human hybrid children who are also ravaged by the plant’s radiation. Unsurprising, as it comes from the writing team of Bradley Thompson and David Weddle, who wrote last season’s best episode “Molon Labe” which pulled off a similarly strong balance. The second episode also introduces a new promising character in Dr. Roger Kadar, the man who keeps the lights on by operating Charleston’s power plant, a task helped by the fact that he refuses to leave his underground laboratory. Kadar is played by Robert Sean Leonard, but unless you watched the credits closely you may have missed it as he’s as far removed from Dr. Wilson on House as you can possibly get— with horn-rim glasses, stringy hair, and an erratic speech pattern, he’s more akin to Brent Spiner’s Dr. Okun from Independence Day. Unlike Brandon Jay McLaren’s Jamil from season two, Kadar has a defined character established from the start, and while it’s only a series of tics there’s hints of a more deeply buried pain in the choices he makes. It’s an interesting character and one who adds another layer of unpredicatability to the show’s formula. The other plot, and the one I’m withholding judgment on for the moment, is Tom and Anne’s child. This was the plot I was most worried about when it was introduced in the season finale, but it doesn’t take the route I was expecting as Anne gives birth to a healthy baby girl named Alexis before the end of the first hour, and aside from some tender family moments it rarely takes center stage. Instead, it goes in a different direction, as Anne starts to notice Alexis is exhibiting behaviors far beyond the typical newborn, with increased motor coordination, spatial recognition, and even uttering “Mama” in a deeply unsettling way. It’s certainly creepy in a good way— when Alexis disappears for a few minutes as Anne searches for her in increasing panic it evokes shades of Trainspotting— but it fails to mesh with any of the big picture plots starting out and feels more like a standalone story for Bloodgold. Though at the moment it’s better than the alternative I predicted, wherein Tom would continue to make a series of stupid decisions to protect his unborn child. Not that the show’s devoid of Tom’s attitudes— as now that he’s president, he’s called upon even more than usual to rally the troops together. Towards the end of the first episode he addresses a public forum, reminding them of the toll that has been paid and their key advantage: “The real weapon, the one that will ultimately gain us victory, is the strength and tenacity of the human spirit.” Though it’s a more interesting statement given that the very nonhuman Volm’s artillery is what’s kept them alive for the past seven months (gah, now even I’m doing it) and Wyle plays his characters with enough innate decency it’s believable, it’s still the same platitudes, which have always been too direct and never been what I’ve come to the show for. But again, as I said in my review of the season finale, I’ve come to accept that as part and parcel of the whole Falling Skies package, and there remains enough good in the whole to keep me watching— for every grand speech or humanistic moment, there’s a scene of Pope playing the iconoclast, Tom and Weaver having a mutually respectful discussion over some Scotch, or a good old fashioned shoot-em-up between humans and mechs. I have my issues with how we got to this point, but now that we’re there I’m interested in where the show goes from here, and in that regard the premiere did its job. Good to be back with you for another season of Spielbergian summer sci-fi shenanigans. There was a lot of good conversation and grumblings last year, and I’m hopeful for more as the show ramps up its game. Speaking of, let’s reintroduce the Falling Skies drinking game, and add one for this episode: Take a drink every time someone says it’s been seven months since the Volm landed. From last season, drink once when Tom has a historical anecdote (we get that here when he compares their new alliance to the Yalta Conference), drink twice when Pope references a classic TV show, and drink three times whenever anyone makes an inspiring speech. Voice your own suggestions in the comments. One of Falling Skies’ greatest technical strengths is the way it portrays the scope of the resistance, and these episodes are no different. Both episodes use a series of tracking shots to get a feel for Charleston and Popetown, following various characters and conversations and then jumping off to others without ever breaking the shot. Biggest dud plot of the episode: Matt having moments of childhood rebellion as he and some friends blow up part of an abandoned house. I’m assuming the intention here was to show how kids will be kids even in this new world, but there’s no reason to spend time on his skipping math class or yelling at Anne that she’s not his mom. The whole thing felt like a dystopian after-school special. I’m not sure how the Espheni hierarchy allows former slaves to take full command of invading armies, but as someone who loves Jessy Schram in the role of evil mastermind I’m all for it. I don’t feel as bad about the cancelation of Last Resort as I should, because it frees her up to do this and she’s terrific as an antagonist. Noah Wyle’s beard remains awesome.